Top row (l-r): Eric Wang, James Hwang, Daniel Leu, Christine Liang, Ian Lee, James Chen. Bottom row: Charles Cheung, Jordan Nevo, Shirley Lee, Dorothy Dederko, Laura Berstis, Dafna Bitton. 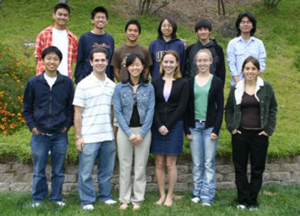 San Diego, CA, June 17, 2005 -- A unique summer program that allows University of California, San Diego undergraduate students to do hands-on, information-technology research in Asia is expanding this year from three to four host countries, and the program is drawing more female students. Thirteen students - five of them women - fly next week from the United States to their respective host sites in Australia, Japan, Taiwan and China, the newest site. The students are part of a pilot program at UCSD called Pacific Rim Undergraduate Experiences (PRIME), launched in 2004 to encourage global experiences for students doing research related to the global cyberinfrastructure. Many of this year's recruits were introduced to the program by word-of-mouth. Shirley Lee is headed for Taiwan. "I heard about the PRIME program through a friend who participated in it last summer," said Lee, a biotechnology major in UCSD's Jacobs School of Engineering, Class of '06. "We volunteer in the same bioengineering lab, so I was able to learn about his experiences in Osaka, Japan last summer." Four of the five students en route to Monash University in Melbourne are enrolled in the Jacobs School's Bioengineering department. Laura Berstis -- who has never been outside of North America before -- and James Hwang will work on computational biology tools with host professor David Abramson, with support from San Diego Supercomputer Center (SDSC) researcher Kim Baldridge. Monash's Abramson will also advise Dorothy Dederko and Jordan Nevo as they develop tools to help optimize solutions of a biophysical model in cardiac muscle cells. Bioengineering professor Andrew McCulloch and his team will support Dederko and Nevo on the U.S. end. These projects all build on research conducted last summer by PRIME students. Abramson and colleague James Whisstock, along with UCSD mentor Eleazar Eskin, will advise Dafna Bitton, who already does research in Eskin's bioinformatics group within the Computer Science and Engineering department and Calit2. Bitton studies the function of variation in gene-coding sequences, and will extend that work to protein structures, while using grid technologies to apply her software to all human genes. Three students will work at the Cybermedia Center of Osaka University in Japan, and all three share the same UCSD mentor: Tomas Molina, who is affiliated with SDSC and the School of Medicine-based National Center for Microscopy and Imaging Research (NCMIR). Christine Liang is a bioengineering major; Eric Wang is from computer engineering; and James Chen is a computer science major. All three will be mentored by professor Shinji Shimojo with support from Cybermedia researchers Susumu Date or Toyokazu Akiyama. Liang and Wang will work on parts of the Biogrid project, including development of middleware and other technologies to speed development of grid-enabled versions of various medical and biology applications. For his part, James Chen (above left) will work on the Telescience project, a longstanding collaboration that allows UCSD researchers to control remotely the world's largest electron microscope at Osaka University, and allows Japanese researchers control of unique imaging facilities at NCMIR on the UCSD campus. Chen will study ways to ease access to computation and data storage at both ends, in part through a grid web portal to be used by Osaka scientists for further research on the data coming from the instruments on both ends. Professor Fang-Pang Lin at Taiwan's National Center for High-performance Computing (NCHC) in Hsinchu will mentor three visiting UCSD undergrad researchers. Bioengineering junior Shirley Lee will enhance a display plug-in first developed last year by a PRIME student for Cytoscape, a bioinformatics software platform for visualizing molecular interaction networks and integrating them with gene expression profiles. Her advisor at UCSD is Bioengineering professor Trey Ideker. Visualization is also at the core of research to be carried out by Charles Cheung (above left), under the guidance of professor Lin in Taiwan and NCMIR researcher David Lee at UCSD. A double major in electrical engineering and physics, Cheung will work on volumetric data projection and processing, whereby very large scientific or medical images (100GB and up) are loaded to memory and maximum-intensity filtered for display on a large matrix of flat panels. Cheung hopes to have a demonstration of the 'globally distributed visualization and data grid' up and running in time for iGrid 2005 in September, which will be hosted by Calit2 at its new UCSD building, now nearing completion. NCHC also leads a major project called Ecogrid, which is deploying wireless backbones in several Taiwanese ecological parks to enable studies of lake metabolism and other phenomena. Electrical engineering major Daniel Leu (with support from his UCSD mentor, Peter Arzberger) will investigate ways to automate access to the wireless backbone by new monitoring sites and sensors, ultimately extending the use of the network. The Computer Network Information Center (CNIC) in Beijing -- part of the Chinese Academy of Sciences -- will host two UCSD undergraduates this summer. Bioengineering major Ian Lee (below left) will work on a bioinformatics project to extend a method jointly developed by his UCSD mentor, pharmacology professor Phil Bourne, for classifying organisms through structural assignments of protein domains. The undergraduate will investigate whether the classification method can be applied to partially sequenced genomes (as it has to whole-genome sequences) to accurately place that genome in the tree of life without needing further sequence information. CNIC's Lu Zhonghua will mentor Lee while he is in Beijing. Also headed for the Chinese capital is John Lee (no relation), a computer engineering major, who is tasked with developing a new visualization of the Active Measurement Project (AMP), which measures global telecommunications networks' performance. His goal is to simplify understanding and analysis of the massive amount of data generated by AMP. Lee can count on plenty of advice from his mentors in Beijing -- CNIC's Kai Nan and Kevin Dong -- as well as from SDSC's Cindy Zheng and Ronn Ritke in San Diego and Tony McGregor of the University of Waikato in New Zealand. "That is a very encouraging sign," concluded Gabriele Wienhausen, provost of UCSD's Sixth College and PRIME's principal investigator. "It shows that last year's students came away with very positive experiences from working alongside researchers in labs where the language and customs may be very different." PRIME is supported by a grant from NSF (NSF INT 0407508) and from the California Institute for Telecommunications and Information Technology (Calit2). It is a partnership of Sixth College, UCSD's Academic Internship Program (AIP), the Pacific Rim Applications and Grid Middleware Assembly (PRAGMA), and the host institutions in Asia and Australia (see below). In recent weeks, the PRIME students attended a series of meetings designed to give them a crash course in living and working in a foreign culture. The meetings were jointly organized with UCSD's International Center, and included a training seminar by University of the Pacific anthropologist Bruce LaBrack, based on his popular program for students abroad, "What's Up With Culture?" "This year we tried to layer more of a framework of cultural competency on the research and ad hoc international experiences these students go through," said PRIME co-organizer Peter Arzberger, director of UCSD's Life Sciences Initiative. "We are also asking the students to answer questions on a weekly basis via email about how they are coping with their host cultures. This is a pilot program, and we're looking at any tools that might add value to the cultural component of these overseas research experiences." "By providing a framework to understand different cultures and how people communicate, we are hoping that these students will better understand the culture of their host sites," added the International Center's William Clabby, who was involved in the cultural competency training. "These students will change as a result of this experience, and will need to change to better understand that culture." Computer engineering junior Eric Wang was attracted to the different culture in Japan, where he will spend the summer. "The idea of being able to do research in a whole new environment was really interesting to me," said Wang, 21, "Not only will I be learning new things that'll help my career and help build relationships, but I get to eat and try to speak the language too!" The quality of the students recruited for PRIME reflects the high barriers to entry placed on the program to ensure top-quality students and research. "The student must figure out a research project even before applying, line up his or her own faculty mentor at UCSD, and then seek out one of the participating mentors half-way around the world," noted Arzberger. "That's a lot of advance work compared to what it takes to land most summer jobs, so the students are fully invested in making the most of this opportunity." The principal investigators on the NSF project, Gabriele Wienhausen and Peter Arzberger, will visit three of the four Asian sites in early July. They want to ensure that student researchers are fitting into their new environments and getting the support they need for their research both locally and from their mentors at UCSD. "This year we worked hard to recruit women students, including a presentation to the UCSD chapter of the Society of Women Engineers," said Tricia Taylor Oliveira, Assistant Director of AIP. "In the end, five out of the 13 students going to Asia are women, and that is a much higher percentage than in the engineering school population overall." Many of the women - and men - who applied for PRIME are Asian American. Wienhausen is not surprised. "We expected a higher number because they may be more comfortable culturally," she said. "Even if they never visited Asia before, some of these students have very personal reasons for going." Shirley Lee has only been to Taiwan once before, as a tourist, but still has family there. "This will give me an opportunity to see all of my relatives again and also experience the culture in Taiwan," she said before leaving. "Last year I spent the summer in Boston participating in the Jacobs School team internship program there. That gave me my first taste of living somewhere besides California. For me, Taiwan is the next logical step." For the biotechnology major, the summer in Taiwan is also a chance to do something different with her research. Much of Lee's work will involve computer programming - a far cry from the 'wet' lab work she is accustomed to doing. "I feel that a variety of experiences is important in undergraduate education," noted Lee, who turns 21 within days of arriving in Taiwan. "This is the time before you commit and specialize, whether you continue in industry or go to graduate school." Laura Berstis agrees. "I applied because I wanted to experience different avenues of research and in general to explore possibilities for what I want to dedicate my life to," said the 20-year-old aspiring bioengineer, one of the few sophomores accepted into the PRIME program this summer . "Research abroad makes it a really full-bodied experience, extending far beyond the technical research experience."